Form Description: Whether you have a single company car or a fleet of delivery trucks, you need to know how much you're spending on gas. Fuel efficiency and spending are easy to track with our gas log. The detailed version includes extensive vehicle information such as license number, VIN, purchase date, make, model and year, as well as an itemized transaction list. The list includes fields for the date, vendor, current mileage, amount spent, gallons purchased, price per gallon, and the MPG since the last fill up. In the Excel edition, the price per gallon and MPG fields are computed automatically. This form is in full-page landscape format. You can download a PDF version of the "Detailed Gas Log (Wide)" form absolutely free. You can also, for a small payment, download a fully editable version of the form that you can customize as you desire. (Don't know which format to choose? Here's how to make your choice.) What would you like to do? 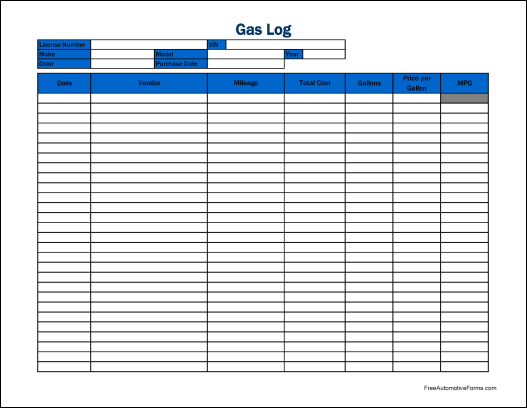 FreeAutomotiveForms' free "Detailed Gas Log (Wide)" form is associated with the following keywords: Driving, Accounting, Free Log Form.